Simulated images of a galaxy 10 billion light-years from Earth, as seen by the Hubble Space Telescope (left) and the proposed High Definition Space Telescope (right), with 25 times the Hubble telescope's resolving power. Scientists have just unveiled a bold proposal for a giant, new, space-based telescope that would be far more powerful than today's observatories. Called the High Definition Space Telescope (HDST), the instrument is essentially a supersize Hubble Space Telescope, with 100 times its ability to detect faint starlight. With an estimated cost of $8 billion to $9 billion, HDST would be a game changer, and if it advances beyond the concept phase, it would launch in the 2030s. 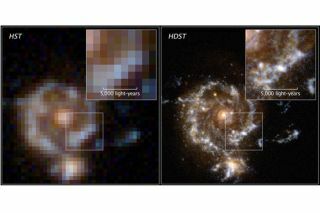 With a mirror 25 times the size of Hubble's, HDST could delve deep into the universe's past to trace how gasses enriched with the elemental ingredients of life moved in and out of galaxies. HDST also could examine dozens of Earth-like exoplanets that are too tiny for the Hubble telescope and its immediate successor, the James Webb Space Telescope, to see. HDST would scour their atmospheres for signs of alien life, perhaps finally answering whether humanity is alone in the cosmos. To learn more about HDST's promise, join a live Kavli Foundation Google+ Hangout on Oct. 6 at 2 p.m. ET (1800 GMT). The Hangout participants will be AURA committee Co-Chairwoman Sara Seager, of the Kavli Institute for Astrophysics and Space Research at MIT, and Co-Chairwoman Julianne Dalcanton, of the University of Washington, as well as AURA committee member Marc Postman, of the Space Telescope Science Institute. The scientists will answer questions about how HDST will trace cosmic evolution, from the primeval rise of chemical elements necessary for life to the potential for alien life right in Earth's cosmic backyard, plus how to build such a powerful instrument. Questions can be submitted ahead of and during this webcast by emailing info@kavlifoundation.org or by using the hashtag #KavliLive on Google+ or Twitter. To join the event, visit kavlifoundation.com. Sara Seager — Seager is a professor of physics and planetary science at the Massachusetts Institute of Technology (MIT), an affiliated faculty member at the MIT Kavli Institute for Astrophysics and Space Research, and co-chairwoman of the HDST study. Her research specialty is exoplanet atmospheres and interiors. Julianne Dalcanton — Dalcanton is a professor in the Department of Astronomy at the University of Washington and co-chairwoman of the HDST study. Her research focuses on the origin and evolution of galaxies. Marc Postman — Postman is an astronomer at the Space Telescope Science Institute (STScI) and served on the committee for the HDST report. His research interests include galaxy-cluster and large-scale cosmic structure evolution and formation, along with large space telescope design and implementation. Adam Hadhazy — The moderator, Hadhazy is a freelance science writer who principally covers astrophysics and astrobiology. He has a master's degree in science journalism from New York University.